Dr. Cynthia L. Burlingame has been in practice in Overland Park since 1989. She graduated from the University of South Carolina with a degree in Biology and received her Doctorate at the University of Houston, College of Optometry. She strives for that friendly, good neighbor environment. Dr. Burlingame promotes long-term connections with her patients, and like the "family doctor" of former eras, she enjoys seeing her young patients grow and helping them meet their full visual potential. Dr. Cynthia Burlingame is dedicated to providing children with a thorough learning-related examination. Dr. Cindi tests all aspects of vision to ensure you have the whole picture of the visual system, not just sight. She regularly attends continuing education seminars to provide the most comprehensive eye care, including detection and treatment of eye disorders. During her 20+ years of practice, Dr. Cindi has been involved in many community and statewide organizations. Dr. Burlingame and her husband, Dr. Jay Burlingame, have two children, David and Morgan. We are here to ensure that your time with us is enjoyable and of the highest quality in care and service. We would be grateful to have you join our patient family! -Cynthia L. Burlingame, O.D. Dr. Jay J. Burlingame is originally from Red Wing, Minnesota. He graduated from the University of Kansas with degrees in Biology and Psychology. Dr J received his professional training at the University of Houston, College of Optometry. In 2010, he became a Fellow of the American Board of Clinical Optometry and in 2011 was awarded Diplomate status from the American Board of Optometry. His uncle's work with NASA in developing new coatings for satellites and optical lenses probably were the seeds for his interest in science and telescopes. After moving to Kansas, the young Dr. Jay could be found spending many hours under the clear, dark sky of Middle America with his trusted telescope searching for Galileo's moons, Saturn's famed rings, and the Moon's Sea of Tranquility. But astigmatism, (a common visual condition where the eye is not perfectly round), prevented the sharpest views possible so it was off to the local Optometrist who put leaves in the trees and added blades to the grass. Dr. Burlingame's special clinical interests include retinal and glaucoma research, contacts lenses, and nutritional education are the focus of his professional practice. He developed the Practice slogan "Great Habits, Great Vision" to help promote how everyday actions effect long term eye health and vision. Dr. Burlingame and his wife, Dr. Cynthia Burlingame, have two children, David and Morgan. Dr. Mock grew up in Nevada, Missouri and attended Southwest Baptist University where she received a Bachelor of Science degree in Biology. She received her optometric education at University of Missouri St. Louis Optometry School where she was active in many organizations such as Volunteer Optometric Services for Humanity and involved with a mission trip to El Salvador giving eye exams and glasses to many who are unable to receive vision care otherwise. Dr. Mock practices full scope optometry for children and adults including treating ocular pathologies such as dry eye and glaucoma as well as fitting contact and spectacle lenses. Dr. Mock started with Burlingame Vision Associates in 2000 and joined the practice permanently as part of Burlingame & Mock Vision Associates in 2008. ​Dr. Mock previously served as secretary/treasurer, vice-president, and president of the Optometric Society of Greater Kansas City and is a current member of the Kansas Optometric Association and American Optometric Association. Outside of optometry, other interests include playing piano, jogging, cooking, and church activities. ​She and her husband Kevin have two daughters, Addyson Jane and Rhyan Josephene. 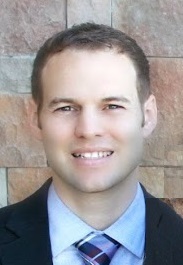 Dr. Eylar earned his undergraduate degree from the University of Kansas. He graduated with honors in 2007 from the University of Missouri-St. Louis College of Optometry. He completed internships in ocular disease at the Kansas City VA Hospital and Kaneohe Marine Base in Kaneohe, Hawaii. Upon graduation from optometry school, Dr. Eylar practiced in Augusta, Georgia for 5 years. He returned to BMVA in July 2012 where he had worked previously as a technician while an undergraduate at KU. ​He is therapeutically certified, (i.e., trained and licensed to diagnose and treat eye disease), to manage eye problems such as glaucoma, diabetes, macular degeneration, infections and injuries. His clinical interests include the diagnosis and treatment of ocular disease, specifically dry eye and glaucoma. Dr. Eylar and is his wife, Dr. Anne Eylar, have one son, Brooks. When he is not chasing his son around, Dr. Eylar enjoys watching all sports and participating in various fitness activities.